The idea of spending hundreds or even more than $1,000 on a smartwatch is crazy to some people, especially when there are shortcomings on popular models that still haven’t been addressed. Battery life is a great example. The Apple Watch won’t even last for two days on a charge, and rival watches from the likes of Samsung aren’t much better. Even Fitbit’s latest smartwatch only runs for four days before it needs to be recharged, and it costs more than $200. 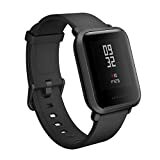 If you want to spend half that much on a smartwatch that works with Android phones and iPhones and lasts for well over a month on a single charge, you’re got to check out the Amazfit Bip Smartwatch by Huami. It has all-day heart rate monitoring, sleep tracking, activity tracking, notification support, and even GPS… and yet it still manages to last up to 45 days per charge! It retails for $100 which is already an insane value, but it’s on sale right now on Amazon for just $65. Definitely grab one before they’re sold out. Be in the Know: The perfect companion to keep you organized and productive all day long. Receive emails, SMS, call reminders, Facebook, Twitter, WhatsApp, LinkedIn, Snap, Slack, weather forecast, and other notifications right on your wrist.